Here’s a Rescue Balm to Help You Survive the Cold, Dry Winter. If you live on the east coast of the U.S., you know there’s a cold front coming. New York City, where we’re based, is forecast to have a high of 17 degrees on Thursday — and that’s without taking wind chill into account. Freezing cold, dry, winter weather can wreak havoc on skin, leading to dry patches and chapped lips, amongst other things, and we previously shared 5 easy ways to change up your winter skincare routine to keep your skin hydrated, healthy, and radiant. What if we when told you there’s one product that can be your general solve-all when you’re on the go, even in 17-degree weather? The Peach & Lily Kbeauty Rescue Balm is an essential item to tuck into your bag and carry throughout your day because you can pull it out for so many of those pesky skin grievances that are caused or aggravated by cold, dry weather. Formulated without mineral oil or petrolatum, the Kbeauty Rescue Balm is made with softening sunflower seed oil, reparative coptis root extract, and soothing centella asiatica extract. The formula is further boosted with other beneficial ingredients — turmeric, ceramides, and panthenol, to name a few. With no added fragrance, the Kbeauty Rescue Balm has a natural, faintly herbal scent that also helps refresh your mind as you apply it. How can you use this Kbeauty Rescue Balm? Here are a few of our ideas, but we’re sure you can think of more. Maybe this is the most obvious way to use the Kbeauty Rescue Balm — as a lip balm. Apply under or over lipstick for a lacquered look, or layer on several times at night before bed for an overnight lip mask for softer, visibly plumped lips in the morning. 2. Use it on your cuticles and nails. When hands are exposed to cold, dry weather, they start feeling chapped, and cuticles are no exception. Dot a bit of the Kbeauty Rescue Balm onto each nail and massage it in gently — the balm will absorb quickly, going to work, helping soften your cuticles, hydrate your nail beds, and prevent unwanted splitting or painful hangnails. We all know elbows can get dry and ashy even in normal weather. 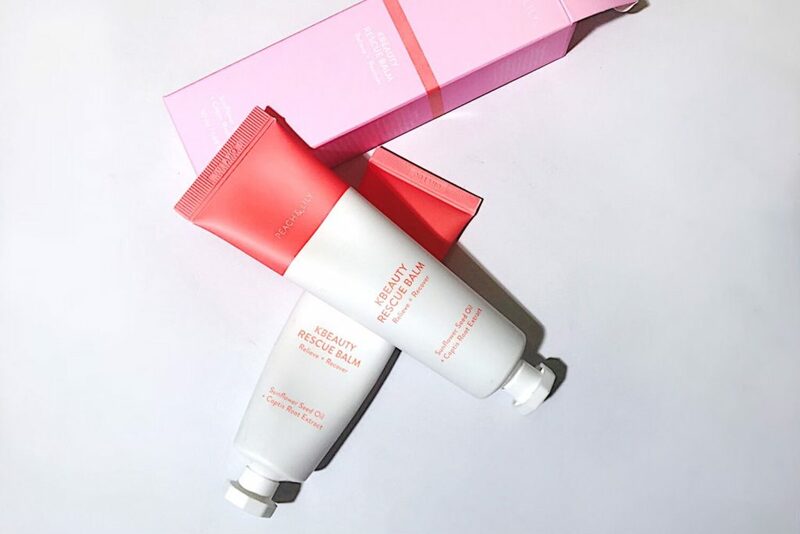 Massage Kbeauty Rescue Balm onto your elbows; it’ll melt into skin, eliminating any ashiness and hydrating without leaving a greasy, oily finish. The best part? A little goes a long way. 4. Catch flyaways and static-y stray hairs. Beanies and hats are essential in cold weather, but, sometimes, they’re not the greatest for hair. They might smush hair or flatten it, and they can also cause static, so you might have strands of hair sticking up all over the place when you get to work or to that special date or wherever! Duck quickly into the bathroom when you arrive and use a little bit of Rescue Balm to tame those flyaways and static-y strands, smoothing them down and adding some healthy shine, so no one would ever believe you were just outdoors in freezing weather. Our feet take a beating on a normal day, and winter can seriously dry out our heels. We recommend first using a pumice stone to gently slough off the worst of any calluses under warm water. Massage some Kbeauty Rescue Balm generously on your heels (and the rest of your feet) and put on a pair of soft socks. Remove after 15-20 minutes — or wear your DIY foot mask to sleep! 6. Soothe your irritated nose. If you’re like us, cold weather gets you sniffling. Sometimes, it’s because we got the cold or the flu, or, sometimes, it’s just something about the cold weather that gets our noses dripping. Either way, we’re more likely to be constantly reaching for tissues when the temperature starts dropping, so our noses start to get irritated and reddened from the constant nose-blowing. To soothe and comfort your nose, dab some Kbeauty Rescue Balm on your nose, gently massaging into skin. It’ll also help protect your nose from the cold, dry air! 7. Prevent makeup from flaking or caking. Dry skin can make it difficult for makeup to apply as seamlessly as it normally might when the weather isn’t so extreme. If you have any stubborn patches where you notice your makeup flaking off, pat on some Kbeauty Rescue Balm to give skin that extra boost of hydration to help makeup stay put. Do you have any other fun, creative ways to use the Kbeauty Rescue Balm?